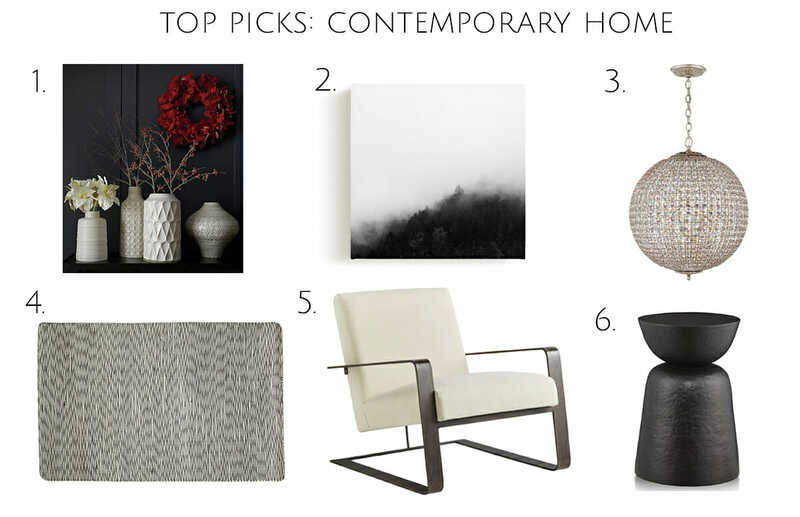 How do you create a cohesive contemporary look in a newly built old-world style home? The owners of this new build were hoping to reach this ultimate goal. They wanted to create an open-concept home with an easy flow as well as a consistent look. The European architecture with stone exterior had to be combined with the ultra-streamlined look of a contemporary house design. 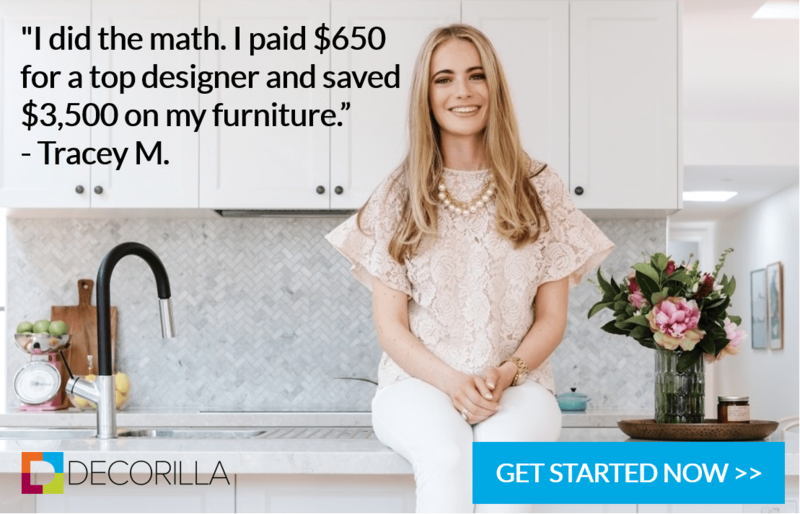 As a result, the owners chose to find an interior designer through Decorilla’s interior design service for a contemporary home design online. 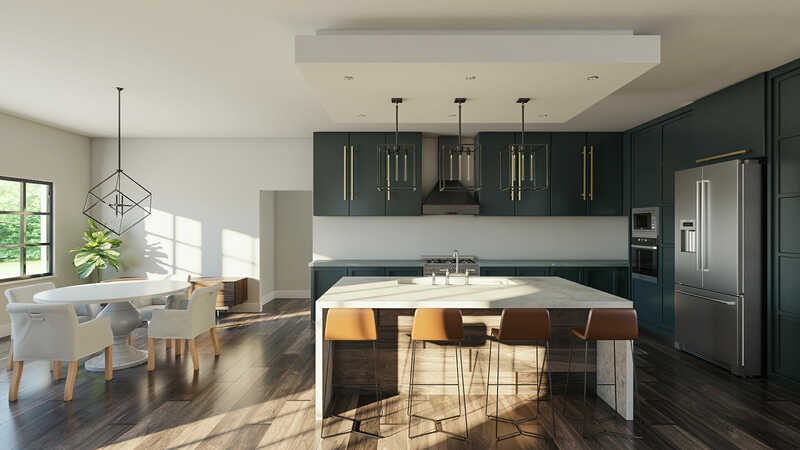 What they found was an online service that helped define their luxury house plans and that suited their style above all. Reconciling the classic elements of European architecture with contemporary house design. 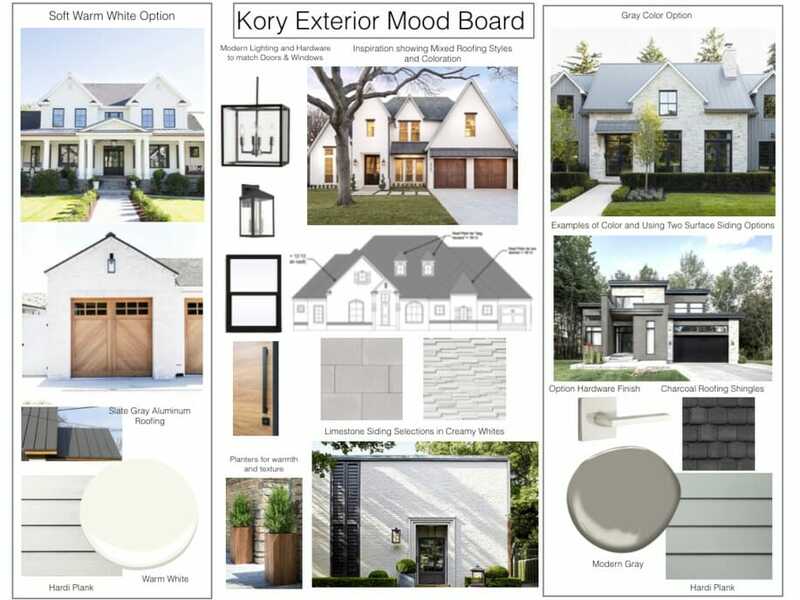 Choosing finishes for the home’s exterior walls and roof. 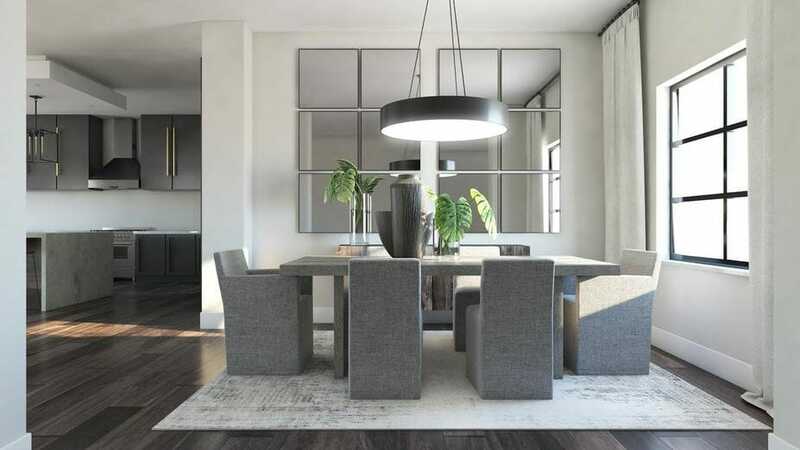 Creating an open-plan layout with an effortless flow as a result. Inspired by monochrome interiors with earthy elements like wood and stone, the clients certainly focused on clean lines and luxury finishes. 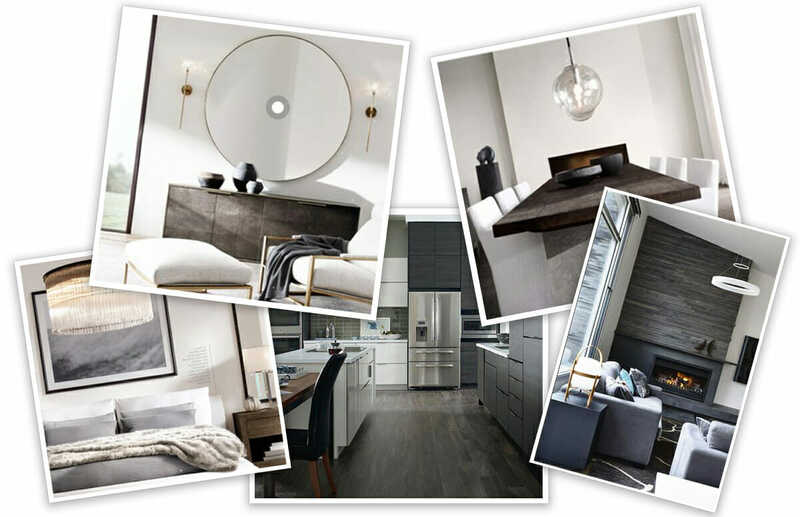 Large statement lighting pieces, recessed dimmable ceiling lights and accent lighting with metallic finishes clearly feature in the contemporary home design online images the clients chose. 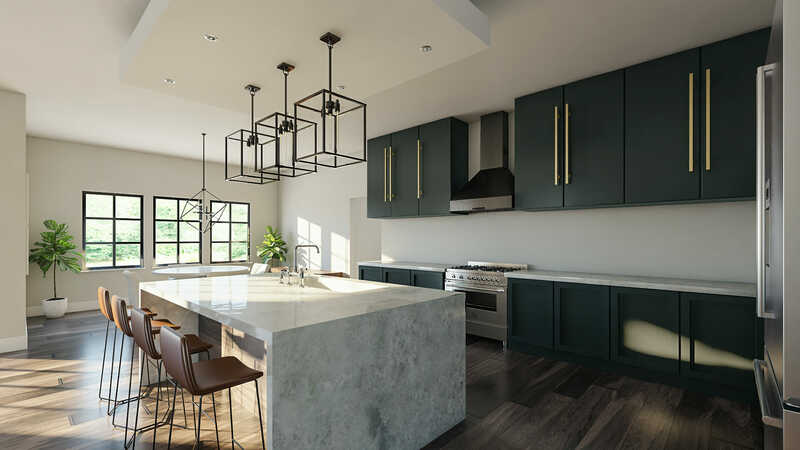 Despite working with only the bare structure, the chosen Decorilla interior designer, Tina G., produced a sophisticated contemporary house design. Light wood accent pieces, concrete and marble, and hammered iron finishes complement layers of grey and neutral white. 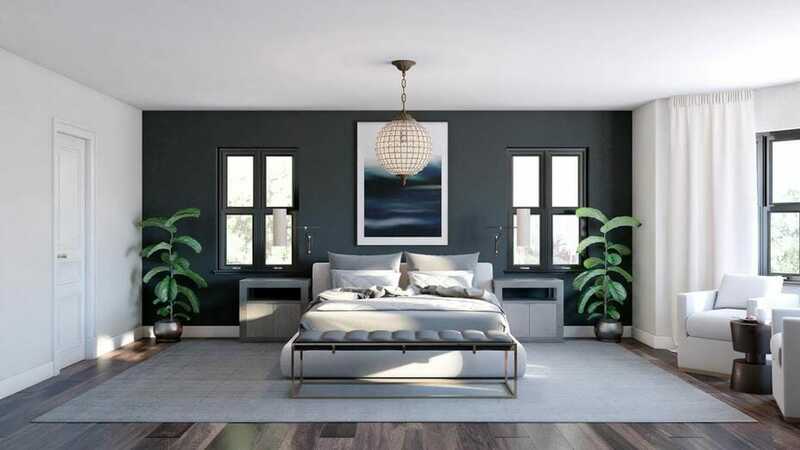 Dark wood floors also create a seamless flow throughout this contemporary home. 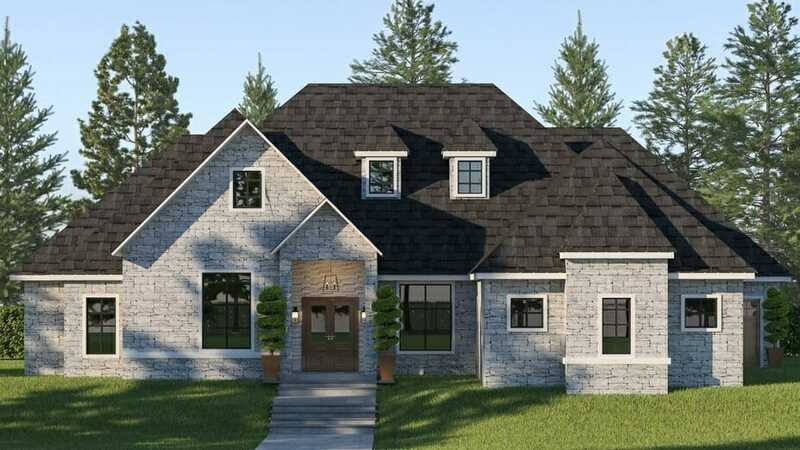 The clients had the choice of multiple design proposals from two different designers, but it was the luxury house plans from Tina that captured the clients’ attention. Although it was hard to choose, Tina incorporated a warm white limestone front with a blond wood front door and contemporary lighting on the front porch that really stood out. 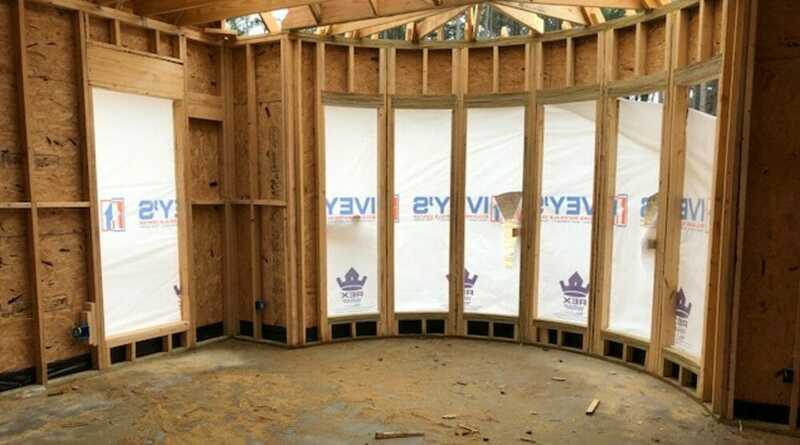 Following the proposal, Tina refined the design and worked on concepts for the rest of the home. The contemporary home plans include state-of-the-art contemporary furniture, finishes and floor plans. Now the home’s European structure is clad in contemporary comfort and luxury. The interior is cozy despite its cooler color palette. The primary color, Mindful Gray has a light shimmering eggshell finish which adds elegance to the interior. Additions of wood and stone give the design an earthy touch which keeps the contemporary house design from feeling stark and unwelcoming. Consequently, the project turned a contemporary house plan into a truly comfortable home. The interior designer chose to layer different tones of white and gray, and incorporate accent pieces in black. The plush sofas, natural light wood accent tables, and potted plants soften the design while adding warm touches. 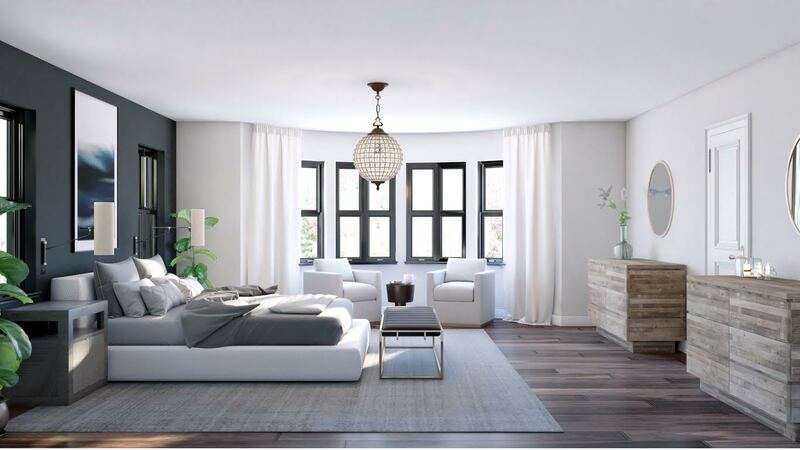 The large windows mean a great amount of natural light comes into the house which is undoubtedly wonderful when choosing a neutral color palette. The deep forest green cabinets highlight the gold cabinet handles and the luxurious marble waterfall kitchen island. 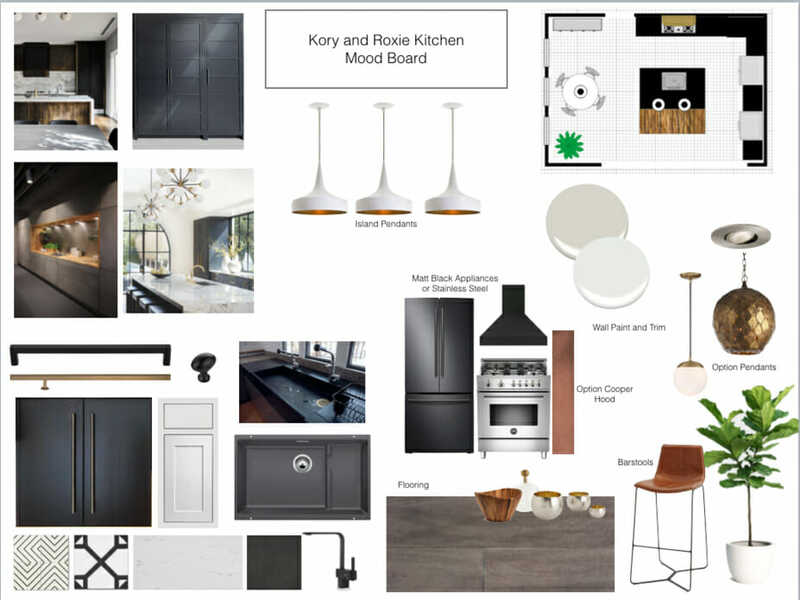 Contemporary deconstructed iron pendant lights give the kitchen a touch of industrial glam. The statement light fixture in front of a mirrored backdrop creates warm lighting for evening entertaining. The addition of the reflective mirrors will make the adjacent wall feel practically invisible and add to the openness of the area. A dark grey wall is the most noteworthy feature that also takes on a blue tint with the nautical artwork layer over it. The symmetry of the windows, accent tables and wall lighting frame a dramatic chandelier as a result. The metallic detail in finishes throughout the bedroom adds a subtle, sophisticated touch. If you need more professional help and a creative eye, consider online interior design services because it is an affordable alternative to traditional interior design services that are much more convenient too. You can also experiment with floor plans and templates on interior design apps online that enable you to experiment. 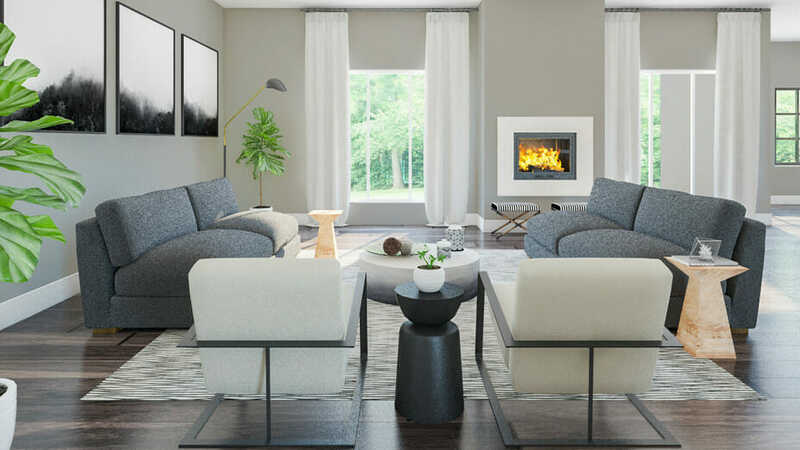 Design your dream house with Decorilla’s online design service and find an interior designer to create your luxury house plans today. The online team can assist with the procurement of items, white glove ordering service, as well as furniture and decor discounts of up to 45% off!